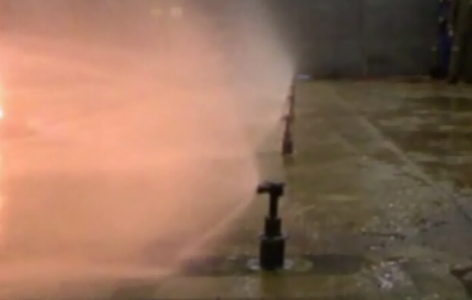 The VID Fire-Kill Model F102-1 low pressure watermist Nozzle is a telescopic pop-up nozzle utilizing low pressure watermist to provide fire protection in aircraft hangar areas below the aircrafts. The nozzle is installed embedded into the hangar floor, flush with the surrounding surface. 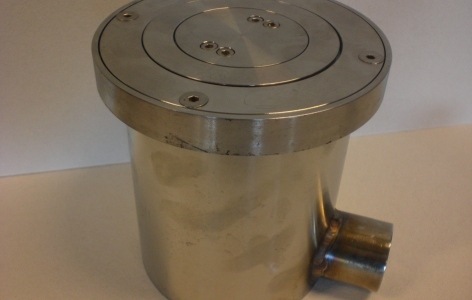 This protects the nozzles in standby position but enables them to perform as needed if a fire occurs. Once pressure is added to the nozzle pipes, the nozzle will elevate from the floor and spray watermist into a 2 by 4 meter area. The Model F102-1 nozzles are successfully tested by the Norwegian Defense, SINTEF and French Marine in full scale fires tests involving hydrocarbon pool fires such as Jet Fuels, Heptane and Diesel oil in trays up to 6m². The Model F102-1 can protect floor areas in any size aircraft hangar. As example the Model F102 nozzles protect small hangars where F16 fighter jets are tested to very large hangars where NATO Boeing AWAC planes are stored.